40 young innovators. 20 STEAM mentors. 20 volunteers. 24 hours. 1. You will support diverse minds innovating for climate action and the City of Fort Collins goal of being carbon neutral by 2050. 2. You will show community leadership and commitment to real answers for climate action mobilization and preparing young scientists, engineers, and innovators to address and manage climate action now. 3. 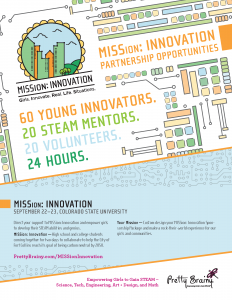 You will be in great company among Colorado leaders in higher education, business, and philanthropy giving young people the hands-on experience and skills-building to develop demonstrably feasible ideas to reduce greenhouse gases. Pretty Brainy is a qualified charitable 501(c)(3) nonprofit organization with tax ID number 80-0958846. Your support is tax deductible.